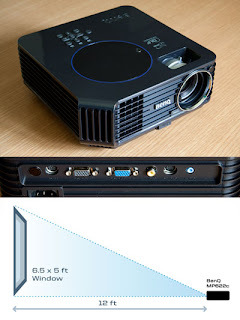 I suppose that if you didn't have that much space, you could position the projector under the window facing the opposite wall of your room and bounce it off a mirror about 6 feet away. That would give you your 12 foot distance as the mirror bounces the image back to the window for the other 6 feet. Just remember to use the frontwards projections for videos with text in them, as the mirror will reverse it for you. Yeah Bob, That's a great idea! It might take a little bit of playing around to get it set up right but would totally work for projecting in tiny spaces. Hi everyone...I'm from Chatham Ontario Canada and last year was my first hallowindow display...was awesome...I had alot of comments by adults n kids alike who said they have never seen *that type of display*, as well as *definately the house of the night*...I used the hallowindow eye as the start of the playlist, followed by hallowindow II..I then added around 40 halloween cgi theme clips files that I found on google video to the playlist (most avg say 50-1:30secs)...some classic movie trailers as well (1933 dracula\frankenstein\bride of frankenstein etc..I purposedly kept the *gory*\slasher type trailers out as I didn't want to scare the lil ones), so together the playtime is just over an hour before it loops back to the start...I noticed that if the clips were small in length per sa (no more then 75 secs), that people were more apt to stick around and watch the next one...then the next one etc etc...was cool to watch the front of the street outside my home start to fill with adults watching the display, and to hear the kids say aloud *hey that's cool*...I have an Infocus 1XA projector, and I drapped a white sheet over the front 10' bay window which I projected the playlist on...speakers were setup outside under the miniature shrubs, and both projector and speakers were connected to my laptop...I simply moved the dining room table close to the back of the couch, and setup both projecter and laptop on...distance from the projector to the window is 12'...this year I am going to add in a fog machine to throw out a mist across the front yard just to add that added touch...gotta add to what was done last year right)...the projector was setup as 16:9...I'll add some snapshots and a video here when I set it all up again this year so you can see my hallowindow)...thanks Mark for creating this idea !! Exact how much space needed for hallowindow projector ?